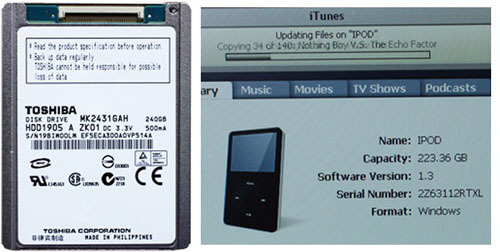 Upgrade Your iPod Video With A 240GB Hard Drive | OhGizmo! I have a fairly large music collection, enough that my 16GB can’t hold it all. For the sake of functionality, I was willing to cut out a few tracks here and there. Now if your collection is enough to fill even the largest iPods, you might consider this offering from Rapid Repair. The company is offering a 240GB hard drive for 1st and 2nd generation iPod Videos. That’s double the size that even the current iPod classic can hold. I’m really not sure why you would need that much music and video with you at all times, but hey, if you’ve got $300 burning a hole in your pocket be my guest. It is unbelievable that company is offering a 240GB hard drive for 1st and 2nd generation iPod Videos. So now not to worry if you have enough collection of video and music. >>It is unbelievable that company is offering a 240GB hard drive for 1st and 2nd generation iPod Videos. So now not to worry if you have enough collection of video and music. That's some might-fine fake commenting there, Lou.